In the wild berry picking season something must be said about crowberries too, although nobody picks them here. But the black berry must at least be tasted. The crowberry dwarf shrub grows in our bogs, mires and heather heaths. The dark green leaves of the plant seem like conifer needles, an observant viewer will see that the leaves are rolled up and appear hollow inside. In the North crowberries are highly valued and they are collected as we pick cowberries or bilberries. On the tundra there is sometimes nowhere to set down one’s feet, the berries are so abundant. In a colder climate the crowberries are juicier and tastier and the seeds don’t grow as big in the berries. 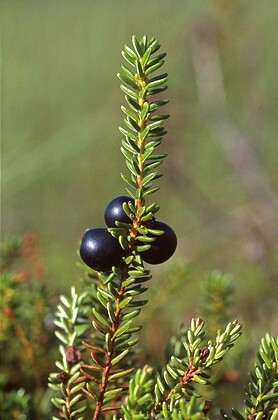 The black berries are preserved similar to cranberries – simply in water. In Estonia crowberries remain mealy and insipid.